Model T Ford Forum: Cracked aluminum piston - amazing. Cracked aluminum piston - amazing. 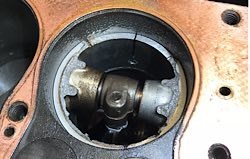 Model T Ford Forum: Forum 2018: Cracked aluminum piston - amazing. Got the ‘21 T 2weeks ago. Pristine condition all the way around. Paid $7,000 for it. But, I Lost a rod bearing a week later on #1 going up my 18% grade hill and thinking I was driving my race car. My fault completely. So, I Replaced all the rods, and did the rings at the same time. In all my years of blown engines I’ve never seen this happen. Ever. And I’ve seen dozens of blown motors. Then again, those motors were all under a year or two old. None were 98 yrs old. I dodged another bullet though. Cylinder wall is still pristine. So I’ve just become one of Lang’s new bestie multiple order customers... do I at least get a T-shirt or something for that? Neat! now you have an ash try. Seen plenty of diesels pop a top but a first for a T.
Car have a known history? 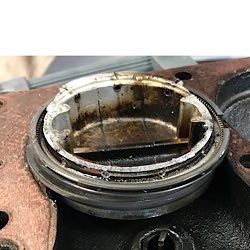 Around 40 to 50 years ago, someone in the industry ran a production of aluminum pistons for model Ts that had a tendency to break exactly like that. I knew several people that it happened to, and one that did it twice on the same engine. A lot of people figured out who the defective supplier was, and replaced the pistons with new full sets. As I recall, the supplier made good to anyone that asked. But I figure there are still a few hundred cars out there with those pistons still in them. Sorry, I don't recall any identifiable markings. Just a thought from someone that has been around for awhile. 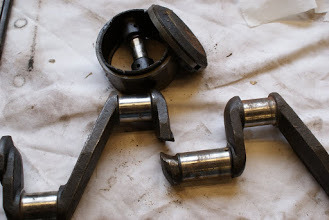 When I joined the 2-piece crank club, one cast iron piston lost its top, but that was because it came up so far that the top ring popped out and pulled the top off on the way down. Then the car stopped very suddenly. Did you check ring end gap when you assembled the new rods and pistons? that would be my 1st guess- are there any score marks on the cylinder walls? I had that happen with a VW Beatle 50 years ago. It gave a warning for quite a while. A ticking noise. I told my wife that if the noise all of a sudden got louder to turn it off and have it towed home. Wayne: I only have the full history on the car starting in '61 from then owner #2. No motor/internal changes are noted. The son of the PO is still alive and I'll ask him if he remembers any motor rebuild. If not, that implies that the motor was rebuilt before '61 some time. That's outside your 40-50 year window. All the pistons are stamped STD, so nothing was bored years ago. I broke the glaze during the rebuild and cleaned the pistons and was ultra careful w/ everything. I suspect this is just fatigue possibly exacerbated by new rings? Im taking no chances and just ordered a complete set of std pistons.- $84 for all 4? that wouldn't even buy me a pair of rod bolts for the 911 race car! Dan: Yes, I gapped *each* ring in each cyl. Plenty of clearance on all. No score marks of any kind on the cyl wall. I did inspect the break w/ a jeweler's magnifier on the strongest lens and it appears there was a hairline crack opposite the wrist pin bolt that had noticeable carbon discoloration. This could have just been a time bomb that finally blew. I do want to give a HUGE shout out to Steve Tomaso up in WA who has tirelessly given me advice and encouragement through all this. His knowledge sharing (and everyone else for that matter) is not something I'm used to coming from the racing world where secrets are closely held. What a welcome change. I'm also loving the raging debates on this forum from topics like oil dippers to brakes. Thankfully, I have a good foundation & engineering background to base my choices on who to take advice from! Wayne: so I just found out from the PO’s son that the motor actually was rebuilt in the late 60’s or early 70’s so it very well could have had the supposed bad pistons from that supplier. Okay. Like I said, I figure there must be a hundred model Ts still out there with those pistons. It would have been the early '70s when we had a bunch of discussions at the local club meetings. Quite a few people replaced their pistons just out of general principles at that time. But I figure a lot of people didn't bother. Regardless, whether these are those pistons or not? You are on the right track to replace the set. I never did hear exactly what the defect was? A cold casting? Too thin? But they usually broke around one of the ring grooves. Thanks for all the support and advice! I managed to replace just the single piston for now and she is on the road again. I had to remove all the rod shims to get her tight and it did alleviate the rod knock. As a newbee this was a great adventure and I feel like I am coming up the learning curve. The babbitt was in pretty good shape and the center main appeared tight from what I could tell. I appreciate the advice to remove all four and that is the plan. I just want to enjoy her for awhile! As Humble Oil used to say-Happy Motoring! Jon. Might want to back off the Nitro going up the hills. welcome to the SLOW lane. Good luck.